The skin of the scalp is unique because it has the highest density of hair follicles. The scalp can be afflicted my many disorders from superficial to infestation. Several scalp problems can cause itching, irritation, dandruff and even hair loss. Below are some of the common conditions which can affect the skin of the scalp. A Bacterial infection of hair follicles causing it to become inflamed. 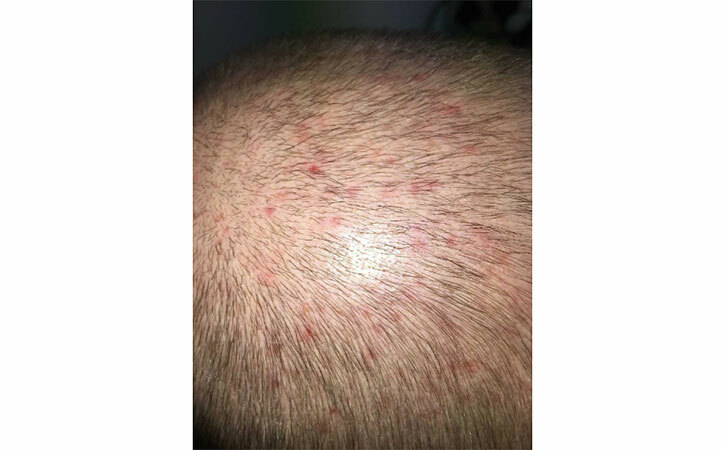 Scalp folliculitis is characterised by small, very itchy pustules on the scalp, often most troublesome on the frontal hairline. White, itchy pustules or pimples form around the follicles on the scalp and eventually crust over. In deep folliculitis, boils or carbuncles may erupt. The scalp affected by folliculitis should be washed with a mild normal shampoo, antidandruff shampoos containing antifungal agents such as ketoconazole or ciclopirox are sometimes helpful. A common, highly contagious infection that often occurs in children. The head louse, Pediculus humanus capitis, is an ectoparasite that feeds on human blood. Head lice usually cause an itch and irritation in the scalp. This can take several weeks to develop after the initial infestation. Medicated shampoos often help, but lice are becoming resistant to some. Patiently combing and removing nits, sometimes over several days, is sometimes necessary. A fungal skin infection commonly occurring in children characterized by ring-like patches around the skin. Tinea capitis is caused by a dermatophyte fungus. Although common in children, tinea capitis is less frequent in adults. Scalp Psoriasis is an inflammatory skin condition involving the auto-immune system that is characterized by red, scaly and dry patches. Whether your scalp psoriasis is mild or severe, there are many treatment options to manage the itching and flakes. Treaments range from over-the-counter shampoos and topicals to light therapy and prescription biologics. 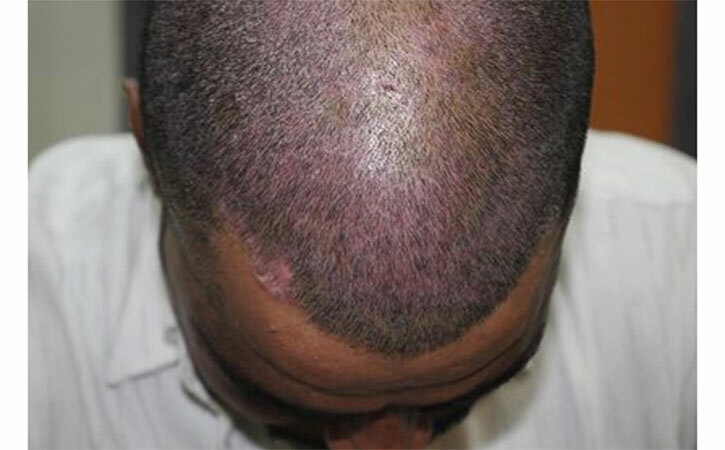 Mild scalp psoriasis is marked by slight, fine scaling while severe scalp psoriasis is noted by thick, crusted plaques covering the entire scalp. Psoriasis can extend beyond the hairline onto the forehead, back of the neck and around the ears. Other skin disorders, such as seborrheic dermatitis, may look similar to psoriasis. 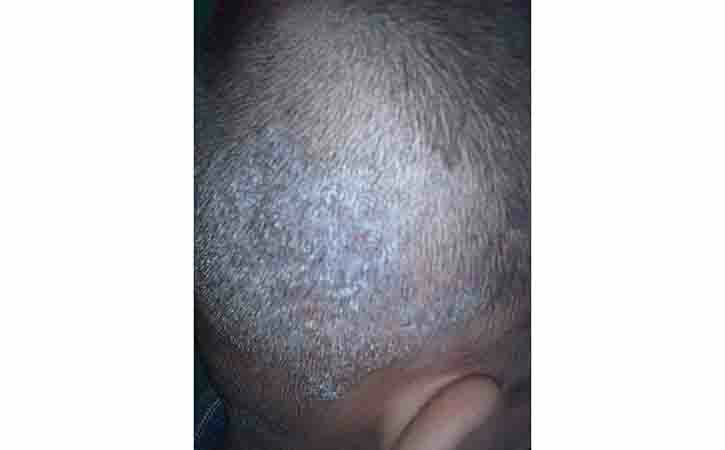 However, scalp psoriasis appears powdery with a silvery sheen, while seborrheic dermatitis appears yellowish and greasy. Seborrheic Eczema is a common inflammatory condition of the scalp. It is characterized by flaky, dry and scaly skin patches; and when these flakes fall off, they are called dandruff. In infants, this condition is called cradle cap. Scaly, greasy patches form on the baby’s scalp. The patches can become thick and crusty, but cradle cap is harmless. Cradle cap usually goes away on its own within a few months. The exact cause of seborrheic dermatitis is unknown, although genes and hormones play a role. 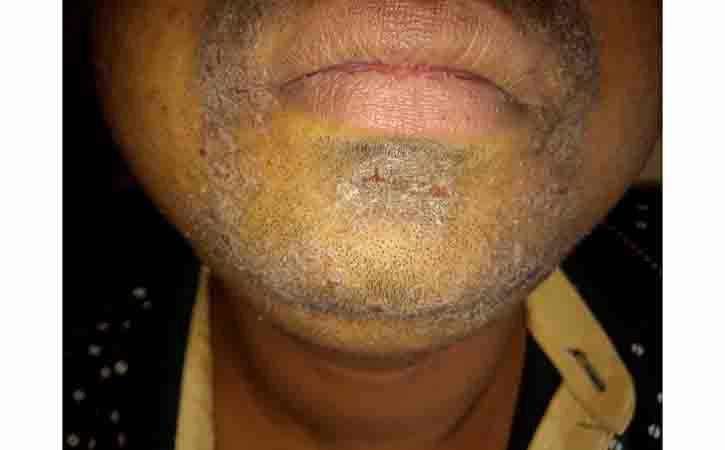 Treatment for seborrheic dermatitis focuses on loosening scale, reducing inflammation and swelling, and curbing itch.